Christmas is now just four days away, and people are prepared for the most wonderful day of the year with their decorations and food. One huge christmas tradition each year however is the announcement of a Christmas number one, the public’s favourite song of the season. This year the choices have been very close in terms of hits, and all come from very different places. Unlike the traditional battle of Rage Against the Machine and the X-Factor winner, there are a selection of good artists which have been consistently holding a number one to three spot. As is tradition with most Christmas number one songs, We Built This City (on sausage rolls) is available to download and in physical copy. Those who want to pick up the actual copy can head down to any local CD shop, including HMV or other retailers and grab the tune. People who are more online centred may choose to head over to Spotify or the Apple Music store, where the single is available to stream and download. With the Apple store, you will need to purchase the song, and to play it ad-free on Spotify you will beed a regular subscription of some kind. This year’s winner is LadBaby, who has come in at number one after weeks of uncertainty between three huge acts. Last year saw Ed Sheeran take the top spot with his song Perfect, and this year’s contenders were Ariana Grande, Ava Max, and LadBaby, all of which have been dominating the charts. LadBaby was a shock contender for the top spot, known as a YouTube and dad blogger, who made his song We Built This City (with sausage rolls) rocketed into popularity. Named Mark Hoyle, the singer promised proceeds from his song would go towards food bank charity the Trussell Trust. Previously he had beaten celebrity dad of the year, so this is another year of fame for the singer. Already, Ava Max had claimed a victory in Ireland, where she clinched the number one spot over Ariana Grande by a hairs breadth. This is a particularly impressive feat considering Ava Max’s song is only her third singer, and two of Ariana Grande’s songs are among top contenders. Ariana Grade’s Thank U Next and Imagine were the prime contenders, having both stuck in the top spot, making her main competition herself. READ MORE: Abba to REUNITE for Christmas? Scott Mills said he was excited to be chosen for announcing this year’s festive favourite. 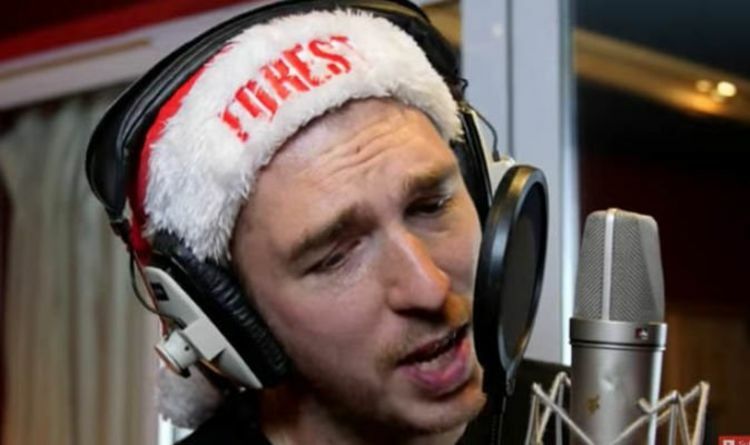 He said: “”I cannot believe I get to announce the Christmas Number 1! “I’m so excited for this show.